“Use it up- wear it out- make it do or do without”. This old pioneer adage is repeated so often in my house my kids start rolling their eyes before I even get to the “up”. I try to make it apply to school supplies, new clothes, cars, and even food. We don’t buy new until what we have is worn out or totally used up. And even then I really like to find a new purpose for the things we are replacing. In my kitchen leftovers get a new life as a new meal, scraps get boiled down to broth, and over-ripe fruits become delicious pies and crisps. Making a conscious effort to use everything up is very rewarding to my pocket-book, the environment, and my sense of creativity and accomplishment. It really bugs me when I can’t think of some way to re-purpose clothes, containers, and other household items. SO- you can imagine my frustration when I find myself with a whole drawer full of canning lids and rings and no ideas for how to put them to use. Fortunately for me, last week my friend and fellow BB site coordinator Carrie shared a brilliant idea for using canning lids and rings to make individual tarts. With her permission I am sharing Carrie’s recipe and pictures here. Slice fruit and mix with sugar, salt, flour, and lemon juice in a bowl. Place the 6 regular mouth lids inside their rings and lightly spray with cooking spray. You can also line them with parchment paper if desired. Roll out the pie crust and, using a wide-mouth lid as a guide, cut the dough into circles. Press the dough into the canning lid "tart trays" making sure that the dough covers the bottom and goes up the sides. Fill each tart with the fruit mixture. Bake at 400 for 35-40 minutes. These ideas got me thinking about other ways to give those old canning supplies a new use. Here are some of the projects that I came up with, or found floating around the internet. • Holiday Ornaments- Print family photos and holiday messages sized to the lids onto sticker paper. Attach to used canning lids with the photos on one side and the message on the other. Attach ribbon to use as a hook for an ornament- try using as a gift tag! • Refrigerator Magnets- Using that sticker paper print up favorite quotes or pictures and attach to the top of used lids. Add a piece of magnetic tape to the back and enjoy- great gift for Grandmas. • Coasters- Attach cork to the bottom of used lids and Mod Podge the top with cute paper, pictures, and photographs- great for a hostess gift or a new bride. • Emergency Candles– Use extra jars and Crisco to make candles for emergencies. • Give old frames new life- Spray paint the lids and rings using bold accent colors and attach to mirrors, picture frames, shelving, etc to give interesting new looks. There are so many ways to re-use those pesky lids, jars, and rings. What have you done to give your canning supplies a new life? LOVE this idea ! Thanks for posting! 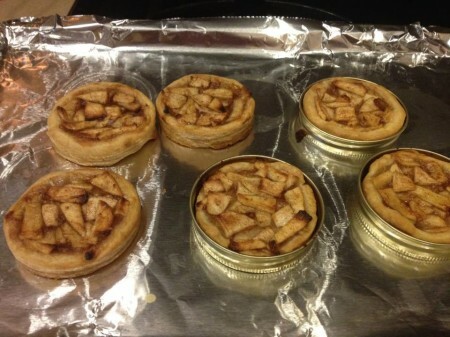 Just turn the inside lid so the metal is against the pastry crust instead of the plastic. I don’t know about the risks associated with flipping them over. The BPA *is* actually the coating on the metal, though. It is used in virtually all metal cans, including soda cans, to prevent corrosion. Here’s one reference: http://www.growingagreenerworld.com/bpa-in-canning-lids-seriously/ I don’t think it’s ever in rubber since it would serve no purpose mixed in with rubber. As for the other side: there are paints/inks there that are very possibly not food-grade since they would never be expected to contact food. I don’t know whether the BPA only coats the inside or if it is ever also on the outside. I just want to make sure everyone has as much information as possible on safety before choosing to use a product for a purpose other than that for which is was designed. 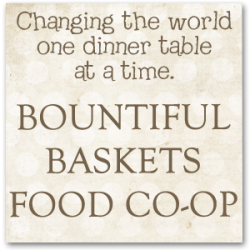 By the way, I LOVE Bountiful Baskets and really appreciate everything you’ve done! The BPA is in the rubber ring around the inside. What we thought was if you flip it to the side without the rubber ring that would be a much better idea! Canning lids contain BPA. If you make these tarts, you are actually baking your pastry IN CONTACT WITH BPA. I really recommend you don’t do this. BPA is in the plastic material lining the lid that prevents it from rusting. When you can, the lid is not generally in contact with your food, and you can at a much lower temperature than you bake. When you bake this pastry, your crust is in direct contact with the BPA, and is at 400 degrees.